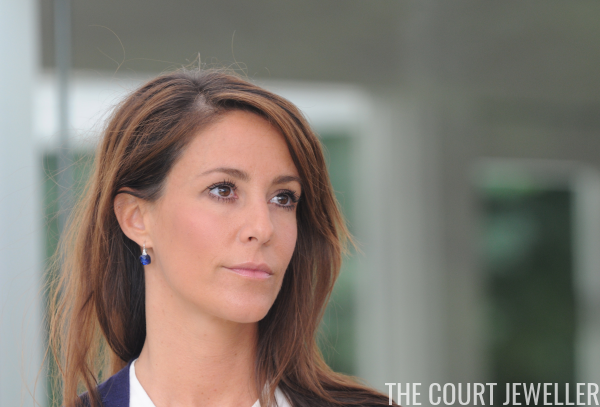 She's the wife of a younger royal son, so she'll never be queen, but Princess Marie of Denmark is very slowly building up a respectable jewelry collection. Along with an heirloom piece (Princess Dagmar's Floral Tiara), Marie also has access to a brand-new diadem. Marie was instrumental in the design of this twenty-first century sparkler, the Flora Danica Tiara. The tiara was made in 2011 by Danish jeweler Anja Blinkenberg for Flora Danica (hence the tiara’s name). With the input of Princess Marie, the tiara was designed with three silver and diamond lilies set atop a base of round amethyst stones, which are apparently Marie’s favorite gem. The lilies represent Marie, her husband, Prince Joachim, and their son, Prince Henrik. The tiara was made before the birth of the couple’s daughter, Princess Athena, and apparently an extra diamond was added to Marie’s lily to represent the baby princess. Supposedly, the tiara represents Joachim traveling to France, finding a “lily,” picking it, and taking it back with him to Denmark. As one does. Just like Crown Princess Mary and the Midnight Tiara, Marie doesn’t actually own the Flora Danica. Instead, the company retains ownership of the piece while giving Marie the exclusive right to wear it. The tiara made its public debut at the Copenhagen Jewelry Fair in 2011, but it took three years for Marie to actually wear it in public. She finally debuted the tiara in March 2014 for a government diner. Unfortunately, it's been back in the vault ever since. Here's hoping we see it again soon!